Posted on October 22, 2013 | Comments Off on Is Your Head in the Clouds? Ladybugs! Attack on the Orange Powdery Stuff? Posted on September 20, 2013 | Comments Off on Ladybugs! Attack on the Orange Powdery Stuff? This summer I worked in the greenhouses on Rice University’s campus tending to tallow trees, clover, and other plants. 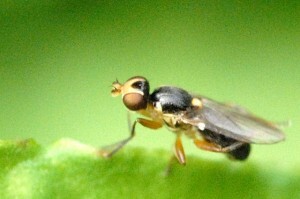 Several different organisms invaded the plants, including spiders and snails. The worst of these pests however, were the spider mites. While watering the plants, I began to notice that many of the clover and tallow tree leaves were fading to a pale yellow, and everywhere I saw yellow leaves there was always what looked like an orange powdery substance on the plant. In taking a closer look I realized that the “powder” was made up of thousands of tiny orange arthropods, the spider mites. Spider Mites are not actually spiders but they are mites in the order Acari and family Tetranychidae. They get the name “spider” from their ability to spin silk webs around the leaves of various plants. There are over 1000 species of spider mites alone, and I think the species I saw was Tetranychus urticae, the red spider mite. Although spider mites do not live longer than a couple of days, their numbers can grow exponentially. One female spider mite can lay 20 eggs a day, and each egg matures into an adult in less than a week. 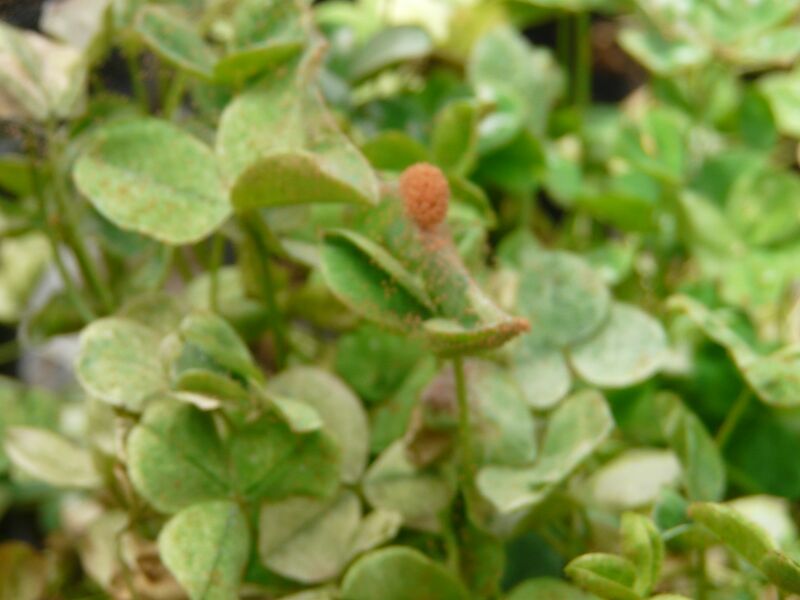 This leads to huge colonies like the one seen in the photo of the clover. The mites eat individual cells on the leaves lowering a plant’s ability to photosynthesize and causing the plant to loose coloration. Pesticides and other treatments are usually ineffective against spider mites because of their fast generation times. Each new generation of these insects develops in 5 to 7 days, which means that a single population of spider mites can build resistance to such chemicals in a matter of weeks. My professor and lab manager Dr. Siemann suggested that we order ladybugs to rid the greenhouse of these pests. Yes, it is possible to order live ladybugs from the Internet! Ladybugs also known as Ladybirds and Ladybeetles are in the beetle order Coleoptera and family Coccinellidae. These insects are amazing predators against pests such as aphids and mites that attack crops and other plants. They are actually considered sacred in many areas of the world because of the “good luck” they bring to farmers. There are over 6000 species of ladybugs; the most common species of ladybug found in the U.S. and the one we used in the greenhouses is Coccinella septempunctata. This ladybug has red elytra with black spots. Other species of ladybugs are black, orange, yellow, and even blue. 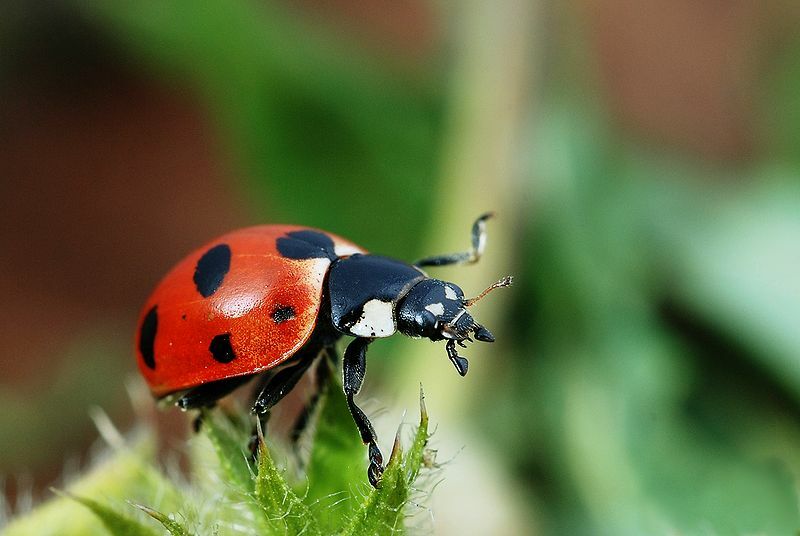 Ladybugs possess the ability to secrete smelly and disgusting substances when in danger. In what is called aposematic coloration, their colorful elytra ward off predators by letting them know they taste bad! Like all beetles, ladybugs have powerful mandibles, which are sharp teeth-like structures that move horizontally. These allow them to munch on several tiny organisms. Once our package of 4000 ladybugs arrived from California we went through the process of distributing them on the leaves of each plant. This took some time, as ladybugs are quick to fly! Surprisingly, over the next week the number of spider mites decreased substantially as well as the number of other pests. The ladybugs must have had a huge appetite from their trip to Texas! Watch this video of ladybugs eating aphids! Comments Off on Ladybugs! Attack on the Orange Powdery Stuff?